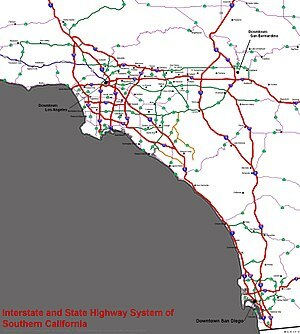 The Southern California freeways are a vast network of interconnected freeways in the megaregion of Southern California, serving a population of 23 million people. The Master Plan of Metropolitan Los Angeles Freeways was adopted by the Regional Planning Commission in 1947 and construction began in the early 1950s. The plan hit opposition and funding limitations in the 1970s, and by 2004, only some 61% of the original planned network had been completed. Southern California's romance with the automobile owes in large part to resentment of the Southern Pacific Railroad's tight control over the region's commerce in the late 19th and early 20th centuries. During his successful campaign for governor in 1910, anti-Southern Pacific candidate Hiram Johnson traveled the state by car, which was no small feat at that time. In the minds of Southlanders, this associated the automobile with clean, progressive government, in stark contrast to the railroads' control over the corrupt governments of the Midwest and Northeast. While the Southern Pacific-owned Pacific Electric Railway's famous Red Car streetcar lines were the axis of urbanization in Los Angeles during its period of spectacular growth in the 1910s and 1920s, they were unprofitable and increasingly unattractive compared to automobiles. As cars became cheaper and began to fill the region's roads in the 1920s, Pacific Electric lost ridership. Traffic congestion soon threatened to choke off the region's development altogether. At the same time, a number of influential urban planners were advocating the construction of a network of what one widely read book dubbed "Magic Motorways", as the backbone of suburban development. These "greenbelt" advocates called for decentralized, automobile-oriented development as a means of remedying both urban overcrowding and declining rates of home ownership. Traffic congestion was of such great concern by the late 1930s in the Los Angeles metropolitan area that the influential Automobile Club of Southern California engineered an elaborate plan to create an elevated freeway-type "Motorway System," a key aspect of which was the dismantling of the streetcar lines, to be replaced with buses that could run on both local streets and on the new express roads. In the late 1930s, when the freeway system was originally planned locally by Los Angeles city planners, they had intended for light rail tracks to have been installed in the center margin of each freeway (which would presumably have carried Pacific Electric Railway red cars), but this plan was never fully implemented. During World War II, transportation bottlenecks on Southern California roads and railways convinced many that if Southern California was to accommodate a large population, it needed a completely new transportation system. The city of Los Angeles favored an upgraded rail transit system focused on its central city. However, the success of the Arroyo Seco Parkway, built between Los Angeles and Pasadena in 1940, convinced many that a freeway system could solve the region's transportation problems. Leaders of surrounding cities, such as Whittier, South Gate, Long Beach, and Pasadena, accordingly called for a web of freeways to connect the whole region, rather than funneling their residents out of their own downtowns and into that of Los Angeles. Pro-freeway sentiments prevailed, and by 1947, a new comprehensive freeway plan for Los Angeles (based largely on the original locally planned 1930s system, but without the light rail tracks in the median strips of the freeways) had been drawn up by the California Department of Public Works (now Caltrans). San Diego soon followed suit, and by the early 1950s, construction had begun on much of the region's freeway system. The construction of freeways often resulted in the demolition of neighborhoods and displacement of their residents. Freeways were a symbol of freedom, civic progress, and the master plan for growth in Southern California as they were celebrated among progressives, freeway planners, and government officials. However, they did not have the same meaning to all as they caused destruction and the displacement of many. There were many freeway revolts won mostly by white middle-class and wealthy communities to stop freeway efforts in certain areas and neighborhoods. These movements rarely extended to communities of color viewed as “slums”, which was suggestive of racism and class privilege. In Southern California, the cancellation of the Beverly Hills Freeway is one of the freeway revolts' greatest successes against the 1958 Master Plan. The freeway would have run right through Beverly Hills, east-west along Melrose Avenue and Santa Monica Boulevard, connecting to the San Diego Freeway. Although freeway planners and government officials targeted minorities and their communities, it did not stop them from inventing their own freeway revolt, such as that of East Los Angeles. Countless communities were ripped apart, isolated, and even completely erased due to highway construction. The development of urban infrastructure created multiple forms of opportunity in communities but decimated others. The highway construction in California was brought by urban renewal programs as it implemented efficiency, growth, and progress, but it also changed the lives of many with lasting consequences (excluding the San Francisco Bay Area, which successfully revolted against two thirds of the freeway plan in the area in favor of BART though revolts in Santa Clara County were unsuccessful). In the 1950s, the Collier Burns Highway Act sparked a surge in freeway construction in Los Angeles. The image of freeways and encouragement to purchase automobiles began to flourish. During this time, the residents of South Central Los Angeles protested against the construction of freeways as the Harbor Freeway was proposed to destroy as many as twenty thousand homes. It would extend south from downtown between Broadway and Figueroa Avenues. Local leaders and South Central residents pleaded to the State Highway Commission to change the proposed freeway routing, but the original plan proceeded. The Division of Highways justified the decision of highway construction and negatively impacting communities in Los Angeles by referring to the concept of “growth” and “progress” in American societies, even after the removal and displacement of thousands of South Central residents as they sacrificed their homes for the construction of the Harbor Freeway. The Hollywood Freeway, also known as US 101, opened in 1954. It is said to be historical as it was outlined by an ancient highway that spread throughout various parts of Los Angeles. The Hollywood Freeway did not come without protest; in 1940, the Hollywood Anti-Parkway League condemned the construction of the freeway as not being part of American culture. Early planning maps proposed the Hollywood Freeway (originally known as Hollywood Parkway) to be constructed across a heavily populated area in Los Angeles. The opposition of the freeway grew as it was planned to extend the freeway toward the downtown area. Although US 101 was ultimately built despite the protest of actors and the Hollywood Bowl Association, highway planners and the state worked to reroute and make compromises. The construction resulted in the loss of historical structures and several homes in Whitley Heights but avoided the local community and many other industrial landmarks such as the Hollywood Tower, the KTTV television station, and the First Presbyterian Church. Extensive landscaping was also installed to suite the complaints of Hollywood Bowl Association and their fear of noise pollution. The Santa Monica Freeway (I-10) was fully opened on January 5, 1966 and is heavily used by many Southern California residents as it is a major east-west highway that extends through much of Los Angeles and California. Between the 1940s and the 1960s, the construction of the Santa Monica Freeway was an immense modern project for urban renewal as it would be the start to connect the nation with superhighways, funded as a statewide and national effort. This plan, like most freeway proposals at the time, would displace countless residents and disrupt local communities. One major route that was originally named the Olympic Freeway would extend between the East Los Angeles Interchange and the Pacific Coast Highway. The mapping of the Santa Monica Freeway was planned to be constructed across densely populated communities as the state would purchase any amount of property to construct this freeway. Community members, homeowner groups, and countless churches that would be displaced with construction began to organize and protest. They focused mainly to denounce the 6.6-mile area of the freeway that would extend west of La Cienega Boulevard. Public hearings were made to speak of the proposed freeway route and the concerns of many. A general agreement of the freeway was that it was needed in Los Angeles to connect the downtown area to the coast. The plan to construct the freeway proceeded, but it was revised to save 47 homes. This change did little to benefit new neighborhoods, who also opposed the plan but were ultimately ignored by freeway planners. Many people were displaced but after many years of slow construction progress, the local protests ended. The East Lost Angeles freeway system and the East Los Angeles Interchange serve as an important center for the Los Angeles freeway network. It is also known for being the cause of displacing countless Mexican Angelo communities, as 19 percent of East Los Angeles is intertwined with freeways. 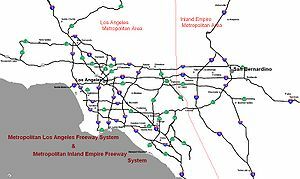 The freeway system grew as multiple freeways were built over two decades: the Santa Ana (5) Freeway (1944), the Hollywood (101) Freeway (1948), the San Bernardino (10) Freeway (1953), the Santa Monica (10) Freeway (extended to the East Los Angeles Interchange in 1961), the Long Beach (710) Freeway (1961), and the Pomona (60) Freeway (1965).Boyle Heights and neighboring communities protested against the first construction phases of the freeways. Community leaders rallied together to fight for their neighborhoods as they circulated petitions and organized public hearings. The construction of the freeways started as scheduled despite the resistance. The numerous freeways in this era displaced many East Los Angeles residents as they had their homes and property seized. Schools, churches, and community parks were also lost from construction. One notable structure lost in Boyle Heights was Saint Isabella Church and the Catholic elementary school. The loss of Hollenbeck Park was also a devastation to the community, since there was already a shortage of parks in the area. The Divide of Highways again justified the loss of communities by contending that residents would save time using the new freeways. Boyle Heights was a densely populated area because of low mortgages that were enjoyed by Mexican Angelo families. When families were forced to give up their homes they struggled to find homes that matched in affordability. Some families were also displaced in gang ridden areas and further from the freeways that they never used. The remaining residents in the area also still suffer the consequences of the construction of the surrounding freeways. Residents are now separated from parts of the community and face many effects of the area's air pollution caused by vehicles. By the 1970s, many cities in the United States, including Los Angeles, were experiencing widespread freeway and expressway revolts, the 1973 oil crisis raised fuel prices dramatically, and growing interest in mass transit resulted in reduced funds being available for freeway construction. The tax revolt of the time also reduced the resources available for infrastructure development and California Proposition 13, which was enacted in 1978, also reduced funds available for highway construction. The 1982 Surface Transportation Assistance Act mandated that a some 11% of the Highway Trust Fund should be used for mass transit schemes. The Century Freeway, which opened in 1993 following widespread community opposition, is likely to be the last freeway built using traditional funding. Overall, only 61% of the freeway miles proposed in the 1954 master plan were built (as of 2004) with a number of key freeways left incomplete or unbuilt; the Long Beach and Glendale freeways were not completed and the Laurel Canyon and Beverly Hills freeways were never started. Other routes which presented expensive engineering challenges (e.g. the Angeles Crest and the Decker Freeways) were also dropped. The result was a system filled with gaps and bottlenecks. That is, many of the freeways that were built ended up with traffic levels far above their original capacity because planners had expected those traffic loads to be shared by other freeways that were never constructed. By contrast, San Diego County is nearing completion of its originally planned freeway system and is using regional sales tax money to support various extensions and building new toll roads like State Route 125 to fill in the remaining gaps. The only major freeway not built was State Route 252 through Barrio Logan. Since the 1980s, nearby Orange County embarked on a program of tollway construction using local funds, and began to apply local financing to freeway construction as well after the turn of the 21st century with the passage and extension of Measure M.
After a deep recession in the early 1990s caused by the collapse of the defense industry at the end of the Cold War and the closure of naval bases, Southern California began to grow again in the latter part of the decade. As in many other areas with rapidly growing populations, the region's infrastructure has had difficulty in keeping up. Traffic congestion in Los Angeles is the worst in the nation, and has been the worst since at least the early 1980s. However, even in the face of the state budget crisis of the early 2000s, plans have been drawn up to radically expand the region's transportation network to accommodate population growth that has already swelled the region's population to 18 million (as of the U.S. Census of 2010) and may see it grow to 25 or even 30 million in the coming decades. Environmentalist sentiments, high fuel prices, and the dearth of available land may result in future development taking a pattern along the mass transit-oriented lines of the "smart growth" school's recommendations. Beginning originally in the 1970s, a variety of factors, including environmental concerns, an increasing population, and the high price of gasoline, led to calls for mass transit other than buses. In 1976, the State of California formed the Los Angeles County Transportation Commission to coordinate the Southern California Rapid Transit District's efforts with those of various municipal transit systems in the area and to take over planning of countywide transportation systems. The SCRTD continued planning of the Metrorail Subway (the Red Line), while the LACTC developed plans for the light rail system. After decades, the wheels of government began to move forward, and construction began on the Los Angeles County Metro Rail system in 1985. In 1988, the two agencies formed a third entity under which all rail construction would be consolidated. In 1993, the SCRTD and the LACTC were finally merged into the Los Angeles County Metropolitan Transportation Authority which constructed subway lines and which today continues to construct new light rail and rapid transit lines. An extension for State Route 57 from the Orange Crush interchange to Interstate 405. A toll road that will go through a tunnel in the Santa Ana Mountains from Irvine to Corona. Upgrading State Route 210 to Interstate standards and renumbering the route Interstate 210. A new freeway across the Santa Ana Mountains to relieve congestion on State Route 91, the Riverside Freeway, to provide a new route between the Inland Empire and southern Orange County. A new freeway, the Mid County Parkway, from Interstate 215 in Perris to State Route 79 in San Jacinto. An extension for Interstate 710, the Long Beach Freeway, to its originally planned terminus at Interstate 210, Foothill Freeway, in Pasadena, via a tunnel underneath the city of South Pasadena or some other means. An extension to the State Route 241 toll road to meet Interstate 5 in or near San Clemente. Upgrading State Route 71, the Chino Valley Freeway, to a full controlled-access freeway north of State Route 60, the Pomona Freeway, to Interstate 10, the San Bernardino Freeway, in Pomona. Upgrading State Route 55, the Costa Mesa Freeway, from south of its current freeway terminus at 19th Street in Costa Mesa to State Route 1, Pacific Coast Highway, in Newport Beach, potentially via a tunnel. Construction of the High Desert Corridor, a freeway and expressway between State Route 14, the Antelope Valley Freeway, in Palmdale and Interstate 15, the Mojave Freeway, near Victorville. It would also carry a high-speed rail line to Las Vegas, Nevada. State Route 48 is a completely unconstructed 25.5-mile (41.03 km) freeway to connect at the current SR 14/138 junction and West Avenue E, go east running parallel with East Avenue E and East Avenue G, and terminate in Hi Vista at East Avenue G/200th Street East, at the planned SR 122 freeway. State Route 122 is a completely unconstructed 61.3-mile (98.7 km) freeway, defined to run from SR 14 south of Palmdale, and proceed northeast through Hi Vista, and terminate at the current U.S. 395/SR 58 at Kramer Junction. State Route 249 is a 13.5-mile (21.7 km) unconstructed route that would connect SR 2 north of La Cañada Flintridge with SR 14 south of Palmdale. Angeles Forest Highway (CR N3) follows the general alignment, but Caltrans has no plans to take it over. However, there are plans to explore the building of this route between Palmdale and Los Angeles by tunneling through the mountains. Addition of high occupancy vehicle and high-occupancy toll lanes to freeway segments currently lacking them. Construction of lower-inclined alternate alignments on steep segments of freeway, to enable trucks to climb mountain passes more easily and speed up the flow of automobile traffic. Southern California residents idiomatically refer to freeways with the definite article, as "the [freeway number]", e.g. "the 5" or "the 10". This use of the article differs from other American dialects, including that of Northern California, but is the same as in the UK (e.g. "Take the M1 to the M25") and other European countries (e.g. "La A1"). In addition, sections of the southern California freeway system are often referred to by names rather than by the official numbers. For example, the names Santa Monica and San Bernardino are used for segments of the Interstate 10 even though overhead freeway signs installed at interchanges since the 1990s don't display these names, using instead the highway number, direction, and control city. A freeway 'name' may refer to portions of two or more differently numbered routes; for example, the Ventura Freeway consists of portions of U.S. Route 101 and State Route 134, and the San Diego Freeway consists of portions of Interstate 5 and the full length of Interstate 405. When Southern California freeways were built in the 1940s and early 1950s, local common usage was primarily the freeway name preceded by the definite article. It took several decades for Southern California locals to start to also commonly refer to the freeways with the numerical designations, but the usage of the definite article persisted. For example, it evolved to "the 605 Freeway" and then shortened to "the 605". Sepulveda Pass: Interstate 405 just south of U.S. Route 101 near the J. Paul Getty Museum. Glendora Curve: the transition of the northbound 57 Orange Freeway to the westbound 210 Foothill Freeway; or the eastbound 210 transition to the southbound 57. Formerly part of Interstate 210 before the completion of the newer section of the Foothill Freeway in 2003. The Southern California area has fewer lane-miles per capita than most large metropolitan areas in the United States, ranking 31st of the top 39. As of 1999, Greater Los Angeles had 0.419 lane-miles per 1,000 people, only slightly more than Greater New York City and fewer than Greater Boston, the Washington Metropolitan Area and the San Francisco Bay Area. (American metros average .613 lane-miles per thousand.) San Diego ranked 17th in the same study, with 0.659 lane-miles per thousand, and the Inland Empire ranked 21st, with 0.626. Temecula Valley Freeway from San Diego County line to Lake Elsinore. Sierra Highway (old Rte 14) from Newhall Avenue (formally SR 126/San Fernando Road) to Rainbow Glen Drive. This section is still maintained by Caltrans and is signed as 14U – Unrelinquished. ^ a b c d Avila, Eric. Popular Culture in the Age of White Flight: Fear and Fantasy in Suburban Los Angeles. Berkeley: U of California, 2004. American Crossroads ; 13. Web. ^ a b c d Estrada, Gilbert. “If You Build It, They Will Move: The Los Angeles Freeway System and the Displacement of Mexican East Los Angeles, 1944-1972.” Southern California Quarterly, vol. 87, no. 3, 2005, pp. 287–315. JSTOR, JSTOR, www.jstor.org/stable/41172272. ^ a b c Avila, Eric. The Folklore of the Freeway: Race and Revolt in the Modernist City. Minneapolis: U of Minnesota, 2014. A Quadrant Book. Web. ^ a b Masters, Nathan. “Hollywood Versus the Freeway.” KCET, 16 Feb. 2018, www.kcet.org/shows/lost-la/hollywood-versus-the-freeway. ^ Masters, Nathan. “Creating the Santa Monica Freeway.” KCET, 19 Apr. 2018, www.kcet.org/shows/departures/creating-the-santa-monica-freeway. ^ "Stop the Road Freeway Revolts in American Cities". Journal of Urban History. This article analyzes the freeway revolts that erupted in American cities in the 1960s and early 1970s. Until the mid-1960s, state and federal highway engineers had complete control over freeway route locations. New federal legislation in the 1960s gradually imposed restraints on highway engineers, providing freeway fighters with grounds for legal action. ^ Sahagun, Louis (10 February 2018). "L.A. County set to build its first new freeway in 25 years, despite many misgivings". Los Angeles Times. Retrieved 31 July 2018. Hise, Greg (1999). Magnetic Los Angeles: Planning the Twentieth-Century Metropolis. Johns Hopkins University Press. ISBN 0-8018-6255-8. Taylor, Brian (2004). "The Geography of Urban Transportation Finance," pp 294–331 in Hanson and Giuliano eds., The Geography of Urban Transportation, 3rd Edition. The Guilford Press. ISBN 1-59385-055-7. Schrank and T. Lomax, The Urban Mobility Report 2007. Texas Transportation Institute.